A Summer of sport to remember. That’s what will stand out when looking back at the year 2012. And of all the sporting events it is the London Olympics and Paralympics that will dominate the memory more than any other. At the height of its command of a fascinated viewing public, BBC’s coverage unleashed Super Saturday – a day of British achievement so good that you’d think it had been scripted. But, for once, the storyline was true and a nation admired the sparkling efforts of Jessica Ennis, Mo Farah and Greg Rutherford for the Team GB cause. A Saturday so absorbing, emotional and downright uplifting that the day was afforded its aforementioned adjective. With the images, noise and drama still fresh in the mind from an exhilarating Olympics it was the turn of the Paralympics to take centre stage. A quieter build-up introduced the ‘superhuman’ spectacle onto our screens and Channel 4 was rewarded for its hard work in promoting the second instalment of the Games with its own day of domestic destiny. Ellie Simmonds swam faster than the competition, blade-runner, Richard Whitehead, stormed to victory in the 200m and Natasha Baker won her dressage event. On the same day, husband and wife pairing, Barney and Sarah Storey won the highest accolade in their events; Barney succeeding with partner, Neil Fachie, and Sarah, individually, in the cycling. It was Britain’s most successful day in the history of the Games and was quickly dubbed ‘Super Saturday 2’ in a nod to Britain’s most notable and dramatic 24 hours in the Olympics. Olympic and Paralympic Fever had swept Britain and, in the wake of the awe-inspiring competitions, commentators and the public alike moved to denounce football for its supposed opulence and greed in the professional ranks. The rhetoric contended that the humble, honest Olympians and Paralympians were deserving of the lavish praise heaped on them whilst footballers, forever earning bad press for their vulgar lifestyles, were less deserving of the public’s time and money. But the four-year pinnacle of man’s attempts to enthral through ever-improving physical endurance and skill in a country fortunate enough to host these everyday heroes is a brief and intense sensation not long enough to satisfy a sports-hungry nation like ours. The Games are the ice cream surprise replete with sparklers that you’re treated to every once in a while to football’s bread and butter. And without the bread and butter, as befits the traditional advice, you get no dessert. The football season has kicked off again and the tide of resentment towards the national game has subsided as the public’s love/hate relationship with the sport effortlessly sifts back into our culture. Supporters bemoan ticket prices yet attendances are high, players are despised and idolised in equal measure (none more so than John Terry) and divisions are formed between those whose first language is football and those who shudder at the very mention of the game. It’s a reassuringly predictable state of affairs and indicative of a large part of British culture in the 21st Century. In embracing the very best aspects of our own identity the scope to branch outside of these isles and appreciate developments taking place around the world gets diminished. What was noticeable about the coverage of the 2012 London Games was the overtly British slant to the broadcasts which engendered a feelgood factor across the UK that has rarely been experienced since the turn of the Millennium. Team GB heroes were loudly lauded and splashed across as large a surface area of print as they could possibly be afforded. A welcome process for a nation short on such ebullient patriotism like the US, and thankfully so. But, aside from the long-legged brilliance of Usain Bolt, who remembers the other non-British medal winners. Of course, there are the students of sport who’d probably be able to name every single dressage bronze medallist since 1948 but, for the vast majority, the enduring images will be those of Ennis tearing up on the podium and Jonnie Peacock raucously celebrating a powerful surge of pace for gold. Both brilliant moments and deserving of their elevated places in recent sporting history but replayed a million times and designed to increase national pride in a recession-hit public. Football incorporates a melting pot of nationalities in our game but for those not playing within Britain’s parameters, their efforts can often go unnoticed. This Sunday, four derby fixtures take place on the continent and it would be rude to ignore the undoubted high-adrenaline drama these games are sure to provide as football showcases the very best of regional encounters that generate atmospheres quite unlike any other sporting contest. The day’s exciting schedule starts at 3pm (6pm local time) in Moscow as Spartak host CSKA in Russia’s most eagerly-anticipated football fixture. Attendances can sometimes belie the country’s genuine appetite for football – partially due to every top-flight game being shown on terrestrial television – but for two days every season supporters from all around the country stop to catch the Luzhniki Stadium accommodate the largest crowd of the season for a game between two of the best sides in Russia. 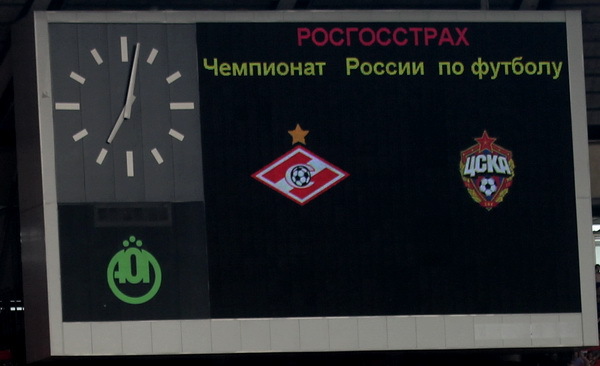 The scoreboard’s ready but who’ll claim Moscow pride? Since CSKA’s two championship wins in 2005 and 2006 the teams have swapped the end-of-season bragging rights equally as Zenit St Petersburg and Rubin Kazan have become the dominant forces in Russian football. Last season’s one-off 44-game marathon saw Spartak pip CSKA to Champions League qualification in second place. The achievement doesn’t look set to spur Unai Emery’s team onto greater success and their European adventure looks set to end at the first round proper after a double dosage of 3-2 reverses to Barcelona and, latterly, Celtic. With no club yet to obviously set the pace in the Russian Premier League, Spartak’s inconsistency has not been fully punished and The Meat find themselves in fifth place and four points behind leaders, Anzhi Makachkala, before Sunday’s game. CSKA couldn’t even make it to the group stage of the Europa League after falling to Swedish side, AIK Solna, in the qualifying rounds. The Army Men’s Swedish surrender looks to have been a blessing-in-disguise as, without European distractions affecting their league campaign, CSKA have recovered from two early defeats in the season to string together the most consistent run of form in the league before Dinamo Moscow won 2-0 at their temporarily-shared Arena Khimki last week. The recent pattern of Moscow supremacy suggests CSKA will finish above their bitter rivals and the two more points secured over Spartak, though a slim advantage, looks likely to increase over the season. But, Sunday’s game at the Luzhniki will be a fierce and unpredictable tie, and perhaps prove me wrong in the most compelling of fashions. At 6.50pm, a global audience will take in ‘El Classico’ and sit glued to their screens as Barcelona host Real Madrid at the imposing footballing mecca that is the CampNou. Not a derby in the true geographical sense of the word, this rivalry has grown in popularity since the personal battle of Ronaldo and Lionel Messi has been waged. Generally considered the two best footballers in the world, with Neymar also touted for the honour by some, the annual red, blue and white explosion of passion and worldwide interest has taken on an extra subplot to an already fascinating mix of national and regional pride in España. The San Siro will be split in half at 7.45pm as AC Milan and Internazionale commence battle to claim the most treasured win in Italy’s fashion capital. ‘Home’ team Milan currently sit in 11th position after six games which have yielded just the one clean sheet. Defeats to Sampdoria, Atalanta and Udinese have had supporters of the Rossoneri squirming in their seats although Wednesday’s away victory at Zenit St Petersburg will have placated the voices of dissent to a certain extent. Massimiliano Allegri’s side features a potential gem of the future in Stephan El-Shaarawy and will be aware of the need to ease fears that AC will not challenge for the title. Inter moved up to third after securing their first home win of the Serie A season against Fiorentina and will hope the San Siro is a happy hunting ground once again as they look to trouble the early pacesetters of last year’s champions, Juventus, and the Edison Cavani-inspired Napoli. Finally, France beckons Le Classique between Marseilles and Paris Saint-Germain at 8pm. The derby is directly modelled on the aforementioned El Classico and pits the country’s two most prestigious clubs together in a match renowned for its special atmosphere. It’s more than city v city as the affair is seen as a north v south encounter. PSG travel to the chief capital of southern France on Sunday and, adding to the intrigue, whoever wins will sit on top of the tree in Ligue 1. It looks set to be a wonderful assortment of football and whether it’s borsch, paella, pizza or a baguette you’re after, you’re unlikely to be disappointed. Don’t miss out on a running order of Olympic proportions. Tuck in. This entry was posted in Analysis and opinion and tagged ac milan, barcelona, cska moscow, ellie simmonds, greg rutherford, internazionale, jessica ennis, john terry, jonnie peacock, lionel messi, london 2012, marseille, mo farah, olympics, paralympics, psg, real madrid, richard whitehead, ronaldo, sarah storey, spartak moscow, stephan el-shaarawy, usain bolt by Andrew Belt. Bookmark the permalink.